The Victorian couta boat was developed during the latter part of the 19th century to work along the coast between Cape Otway and Wilson’s Promontory on Australia’s south coast. This efficient little gaffer reached its peak as a competitive commercial sailing vessel around the 1920s. Modelled on whale boats, ships’ tenders and lifeboats, the couta boats’ ancestors tended to be small, since fish in those days were more abundant and the boats had less need to travel long distances. Mesh netting and hand-lining were pursued in sheltered waters from these early shallow-drafted boats. But as the fish became less prolific the fishermen had to go further offshore chasing such fish as barracouta – from which the couta boat takes its name – and potting for lobsters (crayfish), and a more sea-worthy design evolved. Fishermen working out of such areas as Queenscliff near Port Phillip, Portland and Port Fairy tended to favour the squarer-sterned boat, easier in the bilge, with greater draft and a centreboard which improved sailing and helped in drift fishing. The early rig tended to be a simple standing lug, a carry-over from the small work boats of the mid-19th century, but as the boats travelled further the rig proved inadequate. 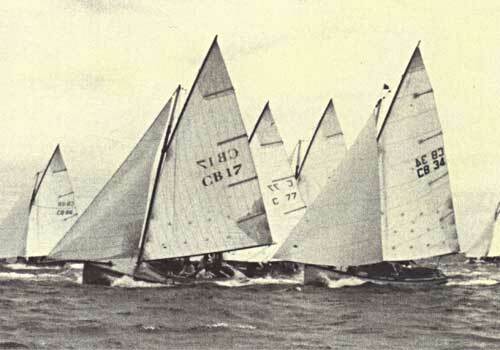 A rig peculiar to the Victorian couta boat evolved which has been called gaff by some and gunter by others, but in truth is a fair marriage of the two. The couta boat’s gaff is peaked a lot higher than usual to allow for closer windward work. Instead of jaws at the forward end of the yard, a ‘barrel’ or ‘tub’ is used; a metal collar usually made of bronze which fits around the mast and is hinged to the gaff. The inside of the collar is lined with leather, which is greased to allow it to slide up and down the mast smoothly. This fitting allows the gaff to be peaked much higher than is possible with the jaws of the conventional gaff. Two or more headsails are also carried, hooked to a traveller on the bowsprit. The art of wooden boatbuilding is unfortunately fast disappearing in these parts, both because of dwindling wood supplies and the lack of men who can fashion straight pieces of wood into beautiful and functional boats. The name Lacco is, however, well known around Port Phillip and further afield as representing the best in traditional boatbuilding. Ken and Harold Lacco and Ken’s son Neil can lay claim to a family history of wooden boatbuilding dating back to the late 19th century. 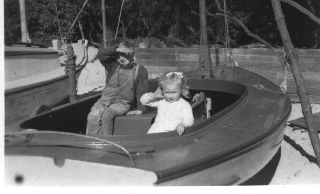 The Laccos have launched more fishing boats than any other such boatbuilders in Victoria, and Ken’s father Mitch Lacco was behind the development of the couta boat as we know it today. 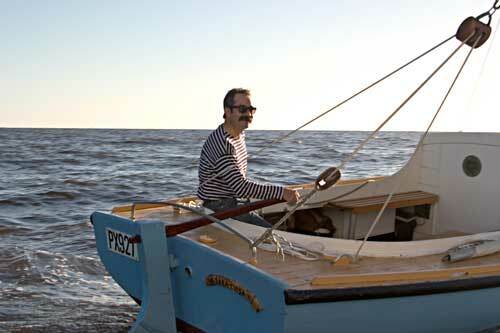 Ken has also been involved in this process of evolution, designing most of the boats he builds himself and adapting the boats to their owners’ needs. Mesh netting, for example, requires boats with a lower freeboard. A major change in design was needed with the advent of diesel engines in the 1930s, when the Laccos had to give their boats a broader stern to take the extra push; without the extra wood there, the bigger motors just dragged the stern down too much. Ken took over the business in 1929 when he was 17, inheriting debts from broken contracts which took the family four years to pay off. The Laccos built a few yachts, but their main business was fishing boats, and mainly the couta boats for which they are famous. The volume of boats produced was staggering by today’s standards, with a 20ft (6.1m) clinker hull taking about a week to build and a 26ft (7.9m) boat, complete with mast, spars and sails, about a month. They also built a number of 60ft (18.3m) supply boats for Papua New Guinea, with inch-thick double diagonal ash planking and oregon pine decks, capable of carrying up to 30 tons. The first power tool the Laccos owned was an electric drill, bought in 1934. Later, they got a bandsaw driven by a petrol engine. An ideal wood, of course, is Queensland teak – called beech down here – but, as Neil says, “It’s rainforest timber, so that’s a no-no.” For the same reason, there is no Queensland kauri available anymore. As alternatives, Neil favours spotted gum and oregon, although he says it’s hard to get good quality lengths. He prefers hardy jarrah for the centreboard casing. 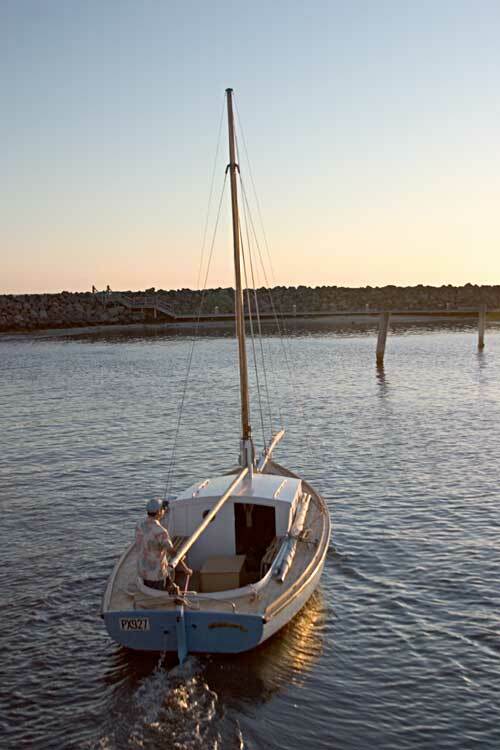 The keel of a 20-28ft (6.1-8.5m) Lacco couta boat is usually 12 x 4in (310 x 100mm) – wherever possible made of jarrah – with a sturdy stem up to 15in (380mm) thick, into which a rabbet is cut using a circular saw and an adze. With the keel upright, a 6-8in (150-200mm) rocker is put into the smaller boats. This is done by propping up both ends, running a bolt anchored to the floor through the middle, and tightening down. As the boat is planked, the rocker is held, and after about the fourth plank the strain is off. “You can probably even undo the nut with your fingers then,” says Neil. Once the keel is red-leaded the ribs are fitted, with the midship ribs set up square and those at either end tilted in slightly – the forward ones aft, and the aft ones forward – to make sure they will lie flat on the planks. Depending on the size of the boat, there are about 60 ribs a side at about 6in (152mm) centres. Six extra ribs are placed in way of the mast and ballast and every second rib is then doubled all the way to the stem. Some larger boats are fitted with sawn frames between every sixth or eighth rib, although Neil feels that these could make the hulls of the smaller boats too stiff. The ribs measure ¾ x 1¾in (19 x 44mm) and are usually made of softwood which is more easily worked and tends not to crack so much. “Hardwood ribs don’t seem to be able to take the stretch,” Neil says. With a single nail fixing each rib to the centre of the keel, the whole is red-leaded and the garboards fitted. Two inch (51mm) copper nails are used throughout, except for fastening the plank ends to the transom where 2½in (63mm) nails give greater hold. While the garboard planks run at full width, about 5in (127mm), for their entire lengths, subsequent planks are tapered forward, and a ‘gusset’ or ‘stealer’ – which is full width at the stern – can be slipped in to make the going easier. The Laccos do not use a spiling board, but mark off the planks in place and plane the bevel by eye. The whole boat is then painted on the inside with three coats, while the outside is planed smooth and sanded clean. Gunwales (or ‘inwales’) and stringers are steamed and fitted, with gunwales fitted along the inside and bolted through every third rib. The deck beams are checked into the gunwales, and on boats of 30ft (9.1m) and over the resulting weakness in the gunwale is made up for by bolting a shelf to its bottom edge. The decking is fixed straight on top of the planking edge and trimmed later. Deck planks on the smaller boats are sometimes tongued and grooved and painted before setting together. The bigger boats have 1¼-2in (44-51mm) planks, caulked with oakum and filled with pitch. The masthead fittings, chain plates and the like were originally cast in solid bronze from original Lacco patterns, but now are more often welded together from stainless steel. In the past, the sails were also made within the family, with Ken’s sister Lucy tearing the 6ft (1.8m) wide sailcloth along the warp into 1ft (310mm) strips. The cost of a large sail then was about £10, but Ken says that working cotton sails only lasted about two years. As a final service to getting the customer on the water, the family also made oilskins. Ken remembers that he had the job of painting them after school using a mixture of half linseed and boiled linseed oil, with a drying agent thrown in. But despite being at the heart of three generations of successful wooden boatbuilders, Ken is sceptical about the future of the industry. Wooden boatbuilding is “on its last legs”, he says. “In the 1930s and 40s, you could get good New Zealand kauri or Tasmanian huon pine. There are boats built in 1938 now in Newhaven harbour that are as good as the day they were launched.” Paradoxically, Ken himself owns a glassfibre boat, which he built himself and says handles well and is easy to maintain. Perhaps more importantly, the traditional skills that the Laccos’ family business represents are also under threat. Thistle is a couta boat restored for exhibition at the National Maritime Museum in Sydney. When it came to putting the rig together, no-one know how it should be arranged and Ken was called upon to supply a set of sail plans and notes on the methods used in the 1920s. The new cloth didn’t lend itself to the vertical cloth sails, so the restorers had to go back to using cotton canvas duck, reviving almost forgotten methods of working. But the point had been made; without reference to the few remaining craftsmen, a part of Australia’s maritime heritage will disappear.